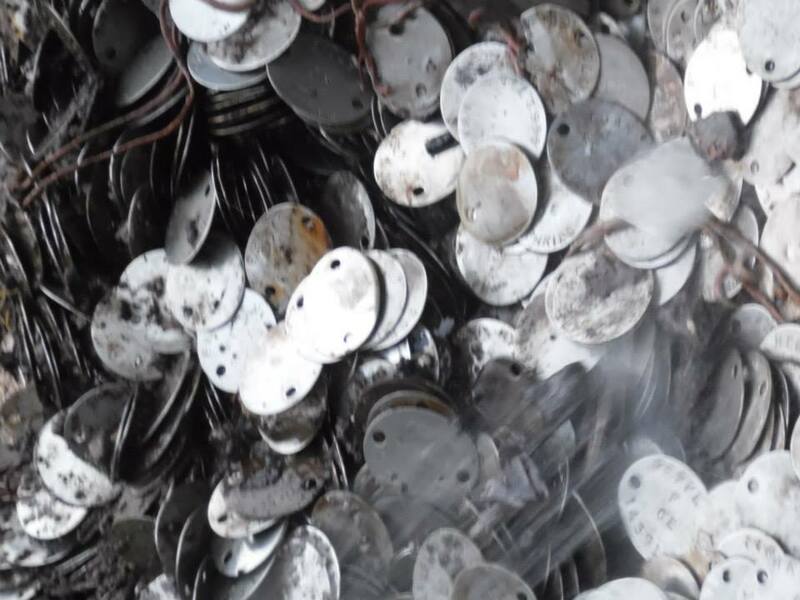 The history of the identification tag has been little researched or logged, despite there being a lot to learn from these discs, now known as ‘dog tags’, because of the information they provide. Nothing could have hit home harder than when relatives received one of these discs - possibly even still blood stained. The first British disc was produced in 1907, the order stated that the discs should be made of 1/8th inch thick steel and should be stamped with the soldier’s number, rank, name, regiment and religious denomination, however the rank was later dropped. In 1914, when WW1 broke out it was quickly realised there would be production and cost problems due to the large volume required, and so a new disc made of red/brown vulcanised asbestos fibre was made. However stockpiles of the original aluminium discs continued to be issued, but these are rarely found today. I have recovered dog tags from both world wars and from various nations, going on a number of quests, including one to have a WW1 Canadian soldier’s name added to a war memorial after it was missed off, almost a 100 years ago. I have found dog tags for those who have been outcast by their own family and who would rather post me photographs and medals than have the dog tag returned to them. Here’s how myself and two fellow relic hunters, Alan and Jay made an incredible find, which has resulted in a task that we need help with today. Before the team travel miles to a new site, usually someone goes out to have a quick look to see if it’s worth a really good search for relics. The site that my fellow hunter, Alan had discovered was a WW2 anti-aircraft battery, but once on site he found pretty much nothing of interest. The site seemed bare, but whilst having a look at the surrounding fields, he found a small copse of trees that contained red brick rubble and typical wartime rubbish. Then something caught his eye amongst the leaves. He picked it up and within seconds realised that he was holding what he thought was a post-war British dog tag. Every digger we have ever spoken to believed that all British dog tags made from metal are post-war, but more on this later. He turned his detector back on and with a wave of it he was receiving signals everywhere. 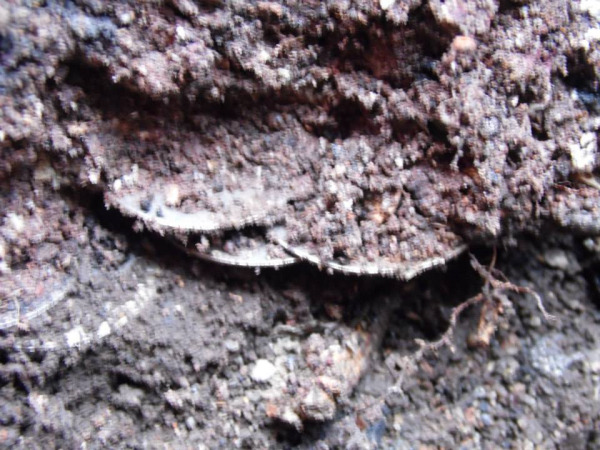 When he put his spade into the ground it revealed not one or two, but what looked like hundreds of dog tags. In fact he found so many that he couldn't carry them all back. So, he back filled the hole, re-burying them, and left for home. In an excited phone call, Alan let Jay and I know of his discovery, he even jangled handfuls of tags down the phone! We agreed for all three of us to dig that site the following Saturday. 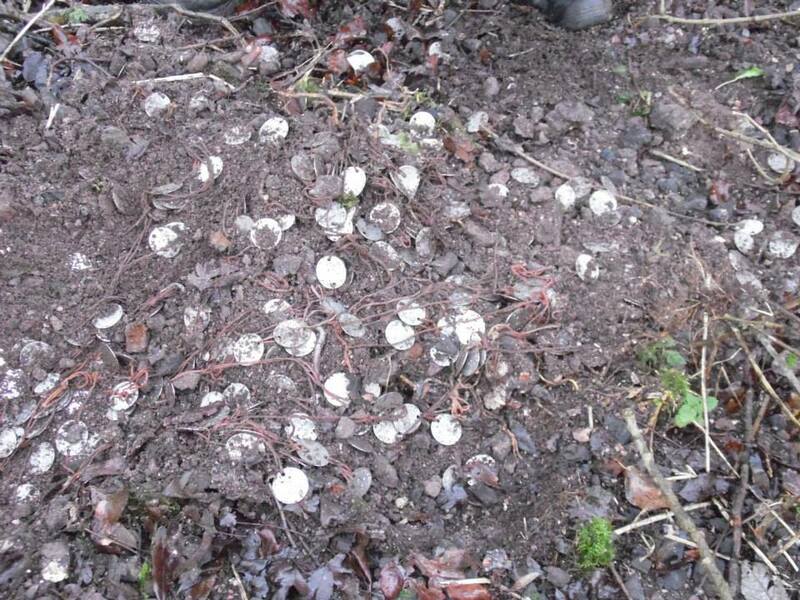 More Dog Tags in the ground. Morning came around and the excitement was almost unbearable, we quickly jumped into one car and drove to the site. I was very unsure of what I was about to see. A short walk into the woods, past some old building bases and rubble and I found my first dog tag of the day just on the surface. I was excited to find one, Alan said "just wait till you see this!" We walked a few more steps away from the rubble and he put a spade into the ground. He removed what he had put back over his previous hole, and it was as if someone had lifted the lid on a treasure chest full of silver coins. I was sure that Jay and I stood there open mouthed for several minutes, before simultaneously almost diving in head first. We had with us two large buckets which were quickly filled. Everywhere we dug in this area we found dog tags. In most places they were as lovely as the day they were thrown in, still glinting in the daylight and with one wipe they looked brand new. I started the day by wiping each one and then reading the names out loud, however this soon grew too time consuming, so we threw them all into the bucket, to be discovered later after cleaning. At the end of the first day the buckets looked rather full and extremely heavy! I rang my beloved and very understanding wife to see if it would be a problem for us to dig again tomorrow. She wasn't keen, but she understands my passion for what I do. Despite the barracking from Jay and Alan she said it was alright. So we lugged all of the dog tags back to the car, which was no small feat! 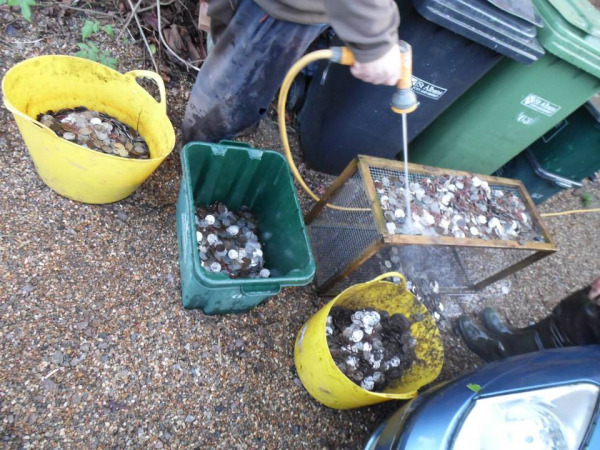 Then back to Alan's to hose them off and divide them into three roughly equal piles. It’s amazing what you can do with bathroom scales. 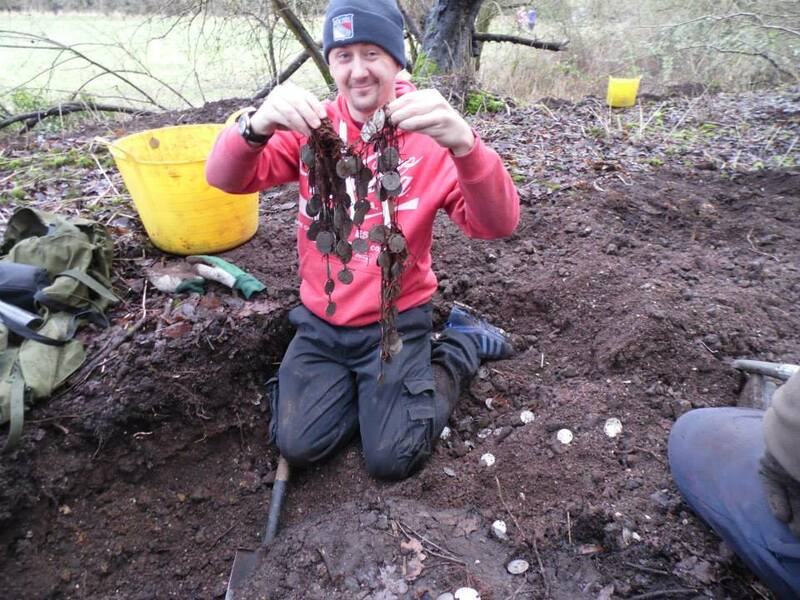 Dan MacKay, an avid relic hunter with his Dog tag find. Once back at Jay's I emptied my bucket of tags onto a sheet on the floor. There were so many tags that they flowed like water revealing names and numbers as they spilled out. I spotted Jays surname on one tag, and handed it to him. I had from the first moment that Alan had found this site said that all these names and numbers needed to be recorded, in the hope that we could return some of them to the families or better still to the veterans themselves, if they were still alive. So the laptop came out and I started right there, that night, logging the serial number, surname, initials, religion, quantity and other notes. I think I wrote about 500 before almost falling asleep with my head on the screen. The next thing I knew, the alarm on my phone was going off. Surely it couldn’t be morning. Light rain, mist, darkness and cold almost sent us back to our beds, but we knew that it would be worth the trouble, and so we were soon out of the door and on our way to Alan's. Once we arrived, Alan called me over and handed me a single dog tag that we had lost when jet washing them clean in his drive the previous day. It was named MACKAY! It was clipped on my house keys and remains there now. Once we arrived back at the site we started filling the same huge buckets all over again. The finding of the dog tags didn't seem to be slowing down at all. Thousands and thousands were being dug up and with no sign of stopping we soon realised that this site would keep us going for some time. Again we left the site and lugged everything back to the car before embarking on another jet washing session to clean them off and divide them up. At that point, I had been in the same clothes for two days of solid digging. I found myself standing in the car park of a bus station with a bag I could barely lift due to holding over six stone of dog tags. I waited for the bus and when it arrived I hauled my bag aboard, and the second I sat down I fell asleep and woke up just outside Bicester, phew, a close call I could have missed my stop. I struggled once again with my bag, which was completely soaked through. For the following few days the list got longer and longer and I wondered how I could even start returning them. Generally, when finding one tag, the thing to do is either return it to the family if they want it, or find out as much as you can and hope you can get a photo of the original recipient. But I had thousands in front of me and no idea where to start, so I just kept writing my list which soon reached 1,500. Tobin, another friend of mine, who has contacts everywhere, suggested that he ask around to try and work out how all the dog tags were related to each other. Together we coined the name 'the forgotten army' for the dog tags; it stuck! Meanwhile I contacted the British Legion hoping that they may had details of ex-servicemen service numbers which meant it would be simple to return some. A few emails went back and forth but ended with them not really wanting to help. Meanwhile the list continued to grow reaching over 2,500 and with another batch of the worst dog tags cleaned up, I could see this topping well over 4,000. I started asking Jay and Alan how they were getting on documenting their share, to which they responded "I would rather go and re-bury them than have to do that". I really wanted the list to be completed as soon as possible so I offered to document their tags as well. The thought of going to dig up more, when we hadn’t even finished dealing with what we already had worried me that we would get totally overwhelmed. Another batch of dog tags cleaned up. But we finally finished compiling the list, and I wrote to all the national newspapers, then to all of the local towns that the three of us were from. Nobody was interested in helping to return any of these dog tags, but not being deterred and thinking that someone must want to help us, or be interested in this story I wrote to all of the TV archaeologists such as Tony Robinson, Dan Snow etc... I was mostly ignored, and Dan Snow was just too busy with other projects. Fine! I then wrote to every military magazine that I could think of, again nothing. I hit a wall. I took out a handful of random tags and started punching names and numbers into Google. Nothing, nothing, nothing, nothing... this continued for hours. I gave up. The tags then sat in organised boxes for over two years, until the last couple of months. I moved house and the tags sat behind me in the window of my new office, casting a shadow over me... literally! I plucked out a couple and a search brought up a website I had seen before - Forces War Records. I figured that if they had information I needed then I would subscribe. With the easy task done, I loaded up the information. What a great website! I then sat entering every name and serial number I had on the list. It was at this point that I was contacted by a gentleman who had heard about my dog tags, and one in particular. It was a dog tag of a soldier called V. Berrett, Service No: 556457. He informed me that it belonged to his friend’s father who fought with the Wiltshire Regiment. He had enlisted in 1936, fighting Rommel in Africa. I told him that I would return it to him as soon as I could. He asked if I could send a letter explaining all that I knew about the tag and in the letter I, of course, asked for as much information that he could tell me about his father’s war time experiences. I also asked if he had a photograph of his father in uniform. So the first tag made its way home. How many more, if any could I return? Using Forces War Records I had a hit with the dog tag to A. HINITT 556057, which led to me to the discovery that he was involved in the Normandy invasion. I then found out that he had revisited Normandy in 2014, from an article written by the Nottingham Post, so I emailed the newspaper and I’m currently hoping that they will be able to contact either Arthur Hinitt or his family, so that I can return the second tag. Arthur Hinitt enlisted at the age of 16 after lying about his age. He served with the Sherwood Rangers, saw action at Operation Market Garden, North Africa and was amongst the first tanks to attempt to take the beach in Normandy. However his tank was hit and it sunk before making it onto the beach. Later in Belgium, whilst in a different tank that was hit, and seconds after he bailed out, it exploded, leaving him with hearing problems. The best result was yet to come. On 6th Feb, 2017 I handed a dog tag over in person to not only a family, but to the veteran himself. Fred Bills’s dog tag began like all the others, cleaned, input into my database, and then run through the Forces War Records website. A hit! I saw that he was wounded once in 1944. I clicked save, then this is where the magic happened. On the site, if someone else has saved a record, a message can be sent to them. I already had a prepared message for this scenario. It basically explains about the dog tags, and if family or friends get in touch I will do my utmost to return it to them. Sure enough the very next day I had an email from Fred’s son, John. John said he was a little sceptical, so I invited him to join my group on Facebook - Extreme Relic Hunters. He did, and from there he sent a few photographs and shared some small snippets of information. We exchanged messages and as I won his trust he invited me to his home when his father would be there and we all had a very pleasant time. Fred told us many stories from his time in the army, from his attempts to volunteer for the RAF, to being drafted into the army and then through Africa, Italy including Monte Cassino and into Austria and later Greece. Most of his stories would have me laughing and some, of course contained the far more serious aspects of war, although even some of those were amusing. Fred had no idea that I had his dog tag with me and was pleasantly surprised to see it, let alone be told he could keep it, as at first he tried to hand it back to me. So another is truly home. A very fantastic experience and one that will certainly spur me on to keep working on these thousands of dog tags. The next tag that looks like as if it has an almost 100% chance of going home is one that was issued by the Royal Ulster Rifles. Although when I looked him up on the Forces War Records website, it showed that he was wounded serving with No.3 Commandos in NW Europe. I knew that as a specialist unit, they were bound to have an online forum. A quick search online saw me swiftly joining a forum and moments after I put up a post I was given the information and supporting documents to prove he was actually in No.3 Commando and more importantly that he had a daughter, although nobody knew where she was. I was however sent the address of who they believed may be his grandson, so I was able to send him a letter. Now although I don't have leads on these next three interesting tags, they are certainly worthy of a mention. Harold Anthony Kilpatrick was serving in 149th Regiment, Royal Armoured Corps, a component of 50th Indian Tank Brigade, at the time of the above cited deeds. The regiment was formed from the 7th Battalion (King's Own Yorkshire Light Infantry), in November 1941, and originally went into action on the Manipur Road in April 1944. 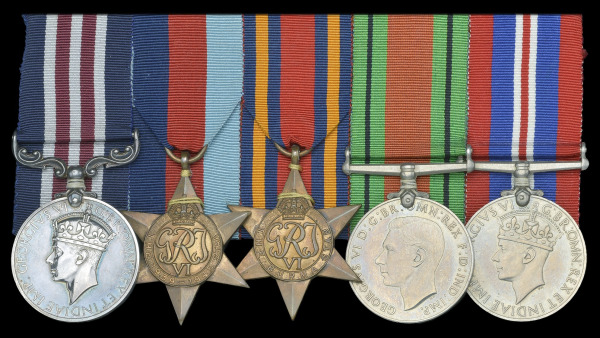 Sadly his medals, like so many others have been sold off by the families over time and went up for auction in 2014 making £2300, £500 over their estimated value. As nice as those medals are, the dog tag I now hold in my hand was worn around his neck that very day. 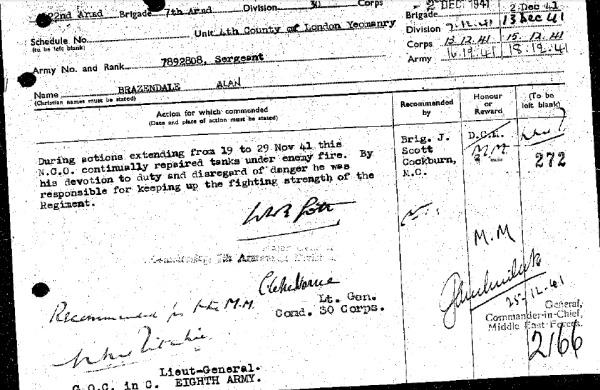 The last tag, from ‘the forgotten army’ belonged to Quartermaster Sergeant Alan Brazendale who had reports of being wounded and then being awarded the Military Medal. Brazendale served with the 4th Country of London Yeomanry, a unit in the Royal Armoured Corps. 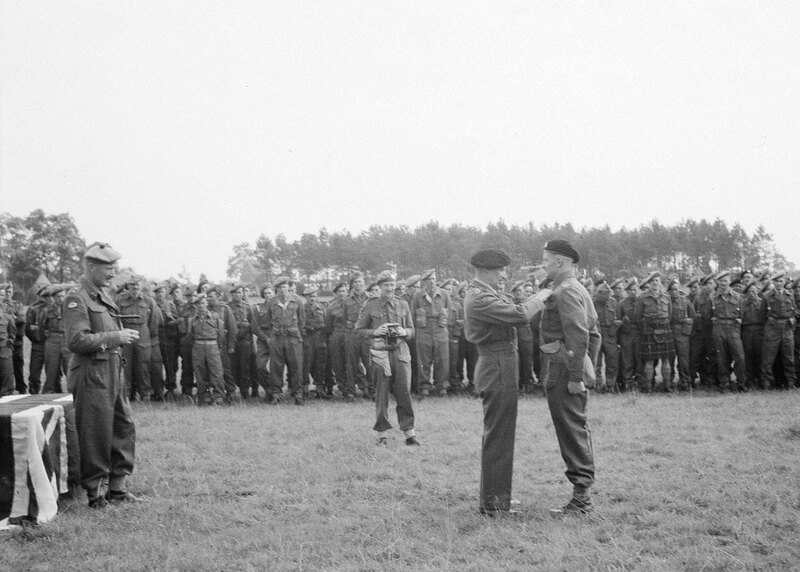 The recommendation is rather bland and simply states that “in devotion to duty and disregard to safety he kept up the fighting strength of the unit.” I began to feel that maybe Pickard had been a little short changed with his Croix de Guerre, however, after doing a bit more research I then found a photograph of Brazendale being awarded the medal from General Montgomery! You can see more information on our ‘the forgotten army’ on the FaceBook Page - Extreme Relic Hunters or please see the website: www.extremerelichunters.com, although it is still in the construction phase, the site is live. On a more important note - if anyone would like to help, either with particular units, awards, or with specific details about metal British dog tags from WW2 then please get in touch. At the moment it’s only Dan Mackay and 'Military Researcher/Archivist' Katey Mishler working on these dog tags and it’s quite a monumental task. Dan MacKay and Kate Mishler encourages people with any information or suspected link to the dog tags to contact him through the Extreme Relic Hunters Facebook page or by visiting www.extremerelichunters.com/fadt. "I am not an emotional person, but I can't dry my eyes. My granddad was my hero, and unfortunately we lost him just a short while ago now. I can't thank you enough!" “The shock, the unexpected gift, the realization that someone was going through rabbit holes seeking them out to offer them this free gift is incredibly moving. It's also a token of a bygone era, something that would have belonged to their loved ones. For people who are still grieving their loss (like the 87 year old widow who lost her husband 4 years ago and received a tag this week), the simple piece of metal with their loved one's initials and serial number attached is a treasure without measure." Dan MacKay - I am a lifetime military history enthusiast and self-published author of two books, currently writing my third with more planned. With a couple of friends I formed a group called Extreme Relic Hunters for which I run facebook groups and a website. My main interests are Canadian WW1, German WW2, US WW1, NAAFI items, Combat photography, Dog-tags and named items from both world wars. I aim to return named items and also collect my own family named medals. 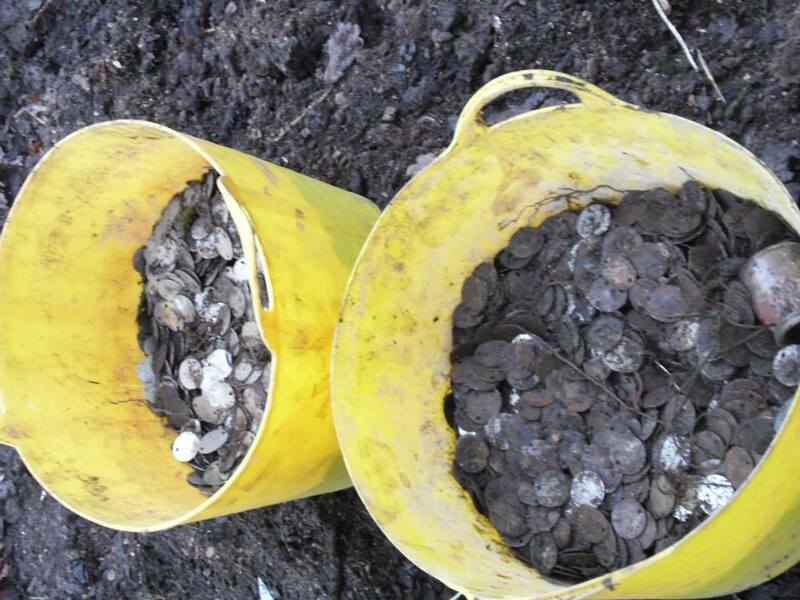 I metal detect, dump dig and trade items to specialise my collection which takes me around south-east England and part of Europe.